When we arrived outside for recess this morning, we immediately noticed that something was a bit off. 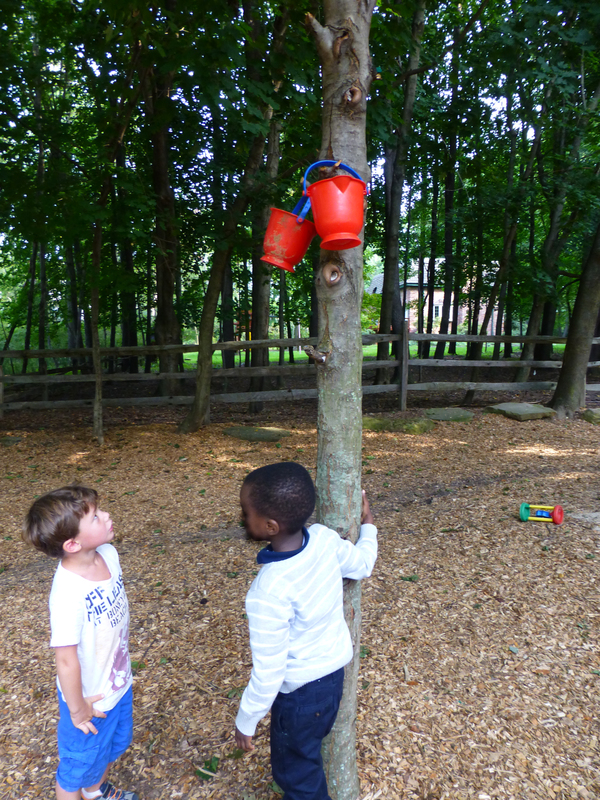 Three of our sand buckets were hanging from a tree. The bottom-most one was within reach and easily retrieved. However, the other two caused a bit of consternation. How would we ever get the buckets down? Mrs. Pless and I stepped back to observe and let the children take the lead in solving the dilemma. The first few comments were rather non-committal, “You are as tall as those, Mrs. Forst.” We didn’t take the bait. Generally, if it is not a direct, polite request, we ignore the statement or help rephrase it to achieve the desired results. For instance, if the children had asked, “Mrs. Forst, would you please get the buckets down for us?” I might have done it. Maybe. The truth is I’d much rather see the ideas they propose. Mrs. Pless and I expected someone to pick up a stick and hit the buckets. (We were practicing our mantra, “Be Safe”, in our heads while overseeing.) Thank goodness that idea did not occur to the children. Instead, one child quickly hopped onto the tree and began to climb it coconut harvester style, hand over hand with his feet sandwiching the tree. Mrs. Pless and I certainly didn’t expect that. Just as we were both getting ready to remind him that we aren’t allowed to climb trees at school, he knocked down the first container. Bucket one solved. Now for the second bucket. The plan worked for the lower of the two buckets, so a couple of children continued to attempt the climb. Unluckily (or luckily? ), the trunk really didn’t lend itself to easy climbing. Eventually we saw two boys arguing over the first bucket. As we were about to intercede and mediate a discussion the argument ended. One of the children firmly grasped the first bucket, arced it over his head, and sent it colliding into the still tree-bound container. With this added pressure, the final bucket fell free. All three buckets were successfully saved by four and five year-olds without a single tip from an adult or need for band-aids.